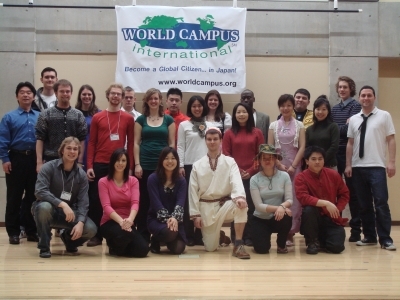 Since Omura city was the very first stop for the February – April 2008 World Campus — Japan participants, we spent time talking about Japanese culture and norms, getting to know each other through various team building activities and preparing for our weekly community appreciation event – the “Arigato Evento”. One of the team-building activities was called “Story of your life” where participants sat around in a circle to voice memorable events in their lives and hobbies. Then the participants found a counterpart who shares a similar experience or hobby to get to know each other even more. Parts of the “Arigato Evento” preparation also focused on learning Japanese songs as well as for preparing “Cultural Pieces”. This is where international participants have the opportunity to demonstrate songs, dances and literary works from their country of origin. The creation of a stage performance itself became a great bonding experience. The high point of the “Arigato Evento” preparation was learning a Japanese song with sign language. “Sekai ni Hitotsu dake no hana” (the one and only flower in the world), is a very popular song originally performed by a Japanese boy-band. The song contains a significant message which is also important for the path to becoming a global citizen: everyone is unique and should be valued for what they are.